Professional holiday decorating services like Christmas Decor by Arvidson, in Crystal Lake, can make any home festive without much effort. Decorating for the holiday season can be a stressful task. When will you decorate? How will you decorate? There are no hard and fast rules when it comes to garnishing your home for the holidays. For the most part, it’s a time to show off your personal flair. If you’re stuck in a rut, there are several tips to follow, trends to explore and technologies to employ to make an easier and safer decorating experience. The outside is the first, and sometimes only, portion of your home neighbors see as they walk or drive by. Each year, Christmas Decor by Arvidson helps about 150 to 200 homes and businesses to make a good impression. In every scheme, Arvidson’s design teams emphasize five elements: the roofline, windows, trees and shrubs, greenery and stake lights. “When all of these design elements are used, the end result is amazing – it’s magical,” Switzer says. Start decorating your own home by hanging lights along the roofline. Anchor them by placing lights in the bushes and adding a wreath on the front door. Make a bigger impact with large fiberglass decorations – think 7-foot toy soldiers or giant ornaments – and line them along the walkway to your house. Such daytime ornamentation has been used in the corporate world for years, Switzer says, but it’s becoming more popular in residential settings. Also more common in front yards are RGB (red, green, blue) lights, which provide the entire spectrum of color. With these lights, homeowners can represent their favorite sports team’s colors, or they can rotate through a vibrant light spectacle. Many lights now incorporate LED technology that makes holiday lighting safer and more energy-efficient. However, Switzer warns that not all LED bulbs are created equal. White bulbs typically found at big-box stores tend to cast a blue fluorescent tone that can feel stark and cold. 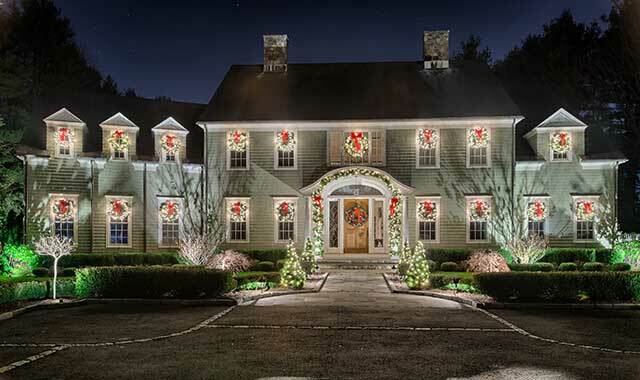 If outdoor decor still seems overwhelming, Christmas Decor by Arvidson can fully design a holiday landscape. The company’s software system uses Google Earth to take a snapshot of your property, which designers use to create a mockup of your holiday display. The lighting service includes design, lights and installation, takedown and storage. Plus, if something goes awry, Arvidson’s crews are there to help. Once you’ve established how you’ll handle your outdoor decor, it’s time to tackle the inside. If you’re a trend follower, consider this: for the past two years, a woodland theme has been popular at Countryside Flower Shop, Nursery and Garden Center, in Crystal Lake. Owls have been the most popular critter, says Pattie Braglia, purchasing manager, but people also are attracted to animals such as moose, deer and foxes. Such critters fit right in with homes and rooms that incorporate a Northwoods decor, but they also blend in with traditional decorations. When it comes to more traditional holiday decor, colors such as burgundy and gold are prevalent in ribbons, silks and ornaments. Browns, creams and more neutral tones also are popular, and they tend to match furniture and wall colors. The more “rustic chic” appeal of this chalkboard decor is also making its way into tableware. Haas says many customers are seeking holiday accents such as black-and-white runners. “We don’t usually get asked for black-and-white, but we are now,” she says. If you plan to host dinner parties this holiday season, you may find the minimalist approach to be an appealing alternative. “People don’t want to be surrounded by all of these things that they have to maneuver around and look out for,” says Bill Olafsen, owner of Olafsen Design Group in Chicago. Olafsen specializes in high-end interior design, and he’s found that instead of decorating, “enhancing” during the holidays is a successful strategy. “So many of my clients have wonderful collections in interesting homes, and they tend to like to enhance rather than create huge, showy displays,” he says. “Those who like to entertain a lot keep their year-round decor, but bring in whites and Christmas-y, wintery colors. To keep decor minimal, spruce up one or two areas of your home that will have the biggest impact. Continue your theme with a similar, but smaller, arrangement in the dining room, Olafsen suggests. While you’re there, consider keeping tableware simple by choosing silver, crystal or white dinnerware. Even better, use the food as a complement to your decor, he says. For example, a green salad with red persimmons gives a subtle nod to the holiday season. Many of Olafsen’s clients prefer these slight variations of traditional Christmas colors, though they’ll occasionally swap primary colors for alternates such as plums and emerald greens. It’s easy to tie those colors into other arrangements around the home. Just as important as visual statements, sounds can help to set a festive mood. Music also provides a way to share your personal interests in a meaningful, yet inconspicuous, way. Religious hymns can represent matters of the heart as well as, if not better than, decorations. If the thought of decorating still gives you nightmares, consider hiring professionals to take on the workload. For one thing, it’s safer to have a professional handle certain tasks, such as roofline lighting. It’s all too easy for homeowners to fall off a ladder or get electrocuted, especially in slippery, cold-weather conditions, says Switzer, of Christmas Decor by Arvidson. In fact, more than 15,000 people annually are treated in hospital emergency rooms for injuries related to holiday decorating, according to the U.S. Consumer Products Safety Commission. There’s also the simple labor factor. Professional designers can take care of everything from start to finish, says Braglia, whose team at Countryside Flowers can handle in-home decoration and Christmas-tree trimming. A team sets up the decorations, and when the holidays are over, they return to restore your home to its pre-holiday order. For many homeowners, it’s worthwhile to ask for help. This entry was posted on Wednesday, November 25th, 2015 at 12:00 pm	and is filed under Home & Garden, Top Posts. You can follow any responses to this entry through the RSS 2.0 feed. Both comments and pings are currently closed.